Cockscomb Celosia is an annual plant that is native to the tropics. 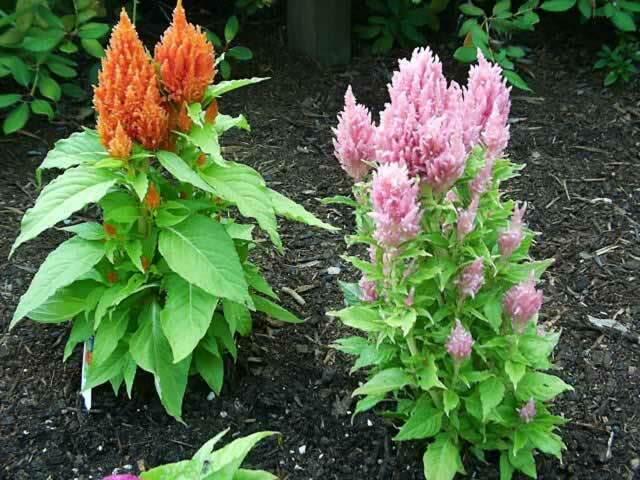 This is a great plant for adding both color and texture to your garden from mid summer until the first frost! Celosias should be grown in full sun and rich, well draining sandy soil. Mulching is recommended to help retain soil moisture. Celosias are low maintenance plants and are mostly pest and problem free other than occasional stem rot or rarely spider mite infestations. Do not plant Celosias in the garden until the soil has warmed sufficiently or their performance will suffer. or started indoors 4 weeks before transplanting outdoors. Barely cover the seeds and maintain a soil temperature of 70°-75°. Germination takes ten to fifteen days. 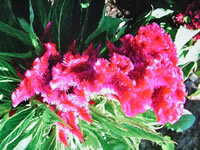 Growers have created many new hybrid forms of Cockscomb plants that are either classified as a Plumosa or a Cristata form. The Plumosa form resemble a plume of Ostrich feathers and can grow up to 16 inches tall with a 12 inch spread. and hang them upside down and out of sunlight in a dry spot. The Cristata form looks like a rooster's comb with crested heads and ridges. Cristata plants can be found from 4" to 4 ft tall with a 6-20 inch spread.